Then I turned, and lifted up my eyes, and looked, and behold a flying scroll. 2 And the angel said to me, What do you see? And I answered, I see a flying scroll; the length is twenty cubits, and the breadth is ten cubits. 3 Then said he to me, This is the curse that goes forth over the face of the whole earth. Every one who steals shall be exonorated from this side like it; and every one that swears shall be exonorated from that side like it. 4 I will cause it to go forth, says the LORD of hosts, and it shall enter into the house of the thief, and into the house of him who swears falsely by My name; and it shall remain in the midst of his house, and shall consume it with the timber thereof and the stones thereof. Then the angel that talked with me went forth and said to me, Lift up now your eyes and see what is this that goes forth. 6 And I said, What is it? And he said, This is the ephah that goes forth. And he said, This is their appearance in all the earth. 7 (And, behold, there was lifted up a lead cover.) And there is one woman sitting in the midst of the ephah. 8 And he said, This is wickedness. And he cast her into the midst of the ephah and cast the lead weight upon its mouth. 9 Then lifted I up my eyes, and looked, and, behold, there were two women going forth, and the wind was in their wings; and they had wings like the wings of a stork. And they lifted up the ephah between the earth and the heavens. 10 And I said to the angel who spoke with me, Where are they taking the ephah? 11 And he said to me, To build it a house in the land of Shinar; and it shall be established, and set there upon its own base. And the whole earth was of one language, and of one speech. 2 And it came to pass, as they journeyed from the east, that they found a plain in the land of Shinar ; and they dwelt there. 3 And they said one to another, Go to, let us make brick, and burn them thoroughly. And they had brick for stone, and slime had they for mortar. 4 And they said, Go to, let us build us a city and a tower, whose top may reach unto heaven; and let us make us a name, lest we be scattered abroad upon the face of the whole earth. 5 And the LORD came down to see the city and the tower, which the children of men builded. 6 And the LORD said, Behold, the people is one, and they have all one language; and this they begin to do: and now nothing will be restrained from them, which they have imagined to do. 7 Go to, let Us go down, and there confound their language, that they may not understand one another's speech. 8 So the LORD scattered them abroad from thence upon the face of all the earth: and they left off to build the city. 9 Therefore is the name of it called Babel; because the LORD did there confound the language of all the earth: and from thence did the LORD scatter them abroad upon the face of all the earth. 6:1 And I turned, and lifted up my eyes, and looked, and, behold, there came four chariots out from between the two mountains; and the mountains were mountains of brass. 2 In the first chariot were red horses; and in the second chariot black horses; 3 And in the third chariot white horses; and in the fourth chariot hail-colored, strong horses. 4 Then I answered and said unto the angel that talked with me, What are these, my lord? 5 And the angel answered and said to me, These are four spirits of the heavens, which go forth from standing before the Lord of all the earth. 6 The chariot in which are the black horses goes forth into the north country; and the white go forth after them; and the hail-colored go forth toward the south country. 7 And the strong went forth, and sought that they might go to and fro through the earth: and He said, Get you hence, go to and fro through the earth. So they went to and fro through the earth, 8 and this caused me to cry out in anguish! And He communed with me, saying, Behold, these that go forth toward the north country have caused My Spirit to rest in the north country. 6:1 And I saw when the Lamb opened one of the seven seals, and I heard one of the four living creatures saying, as a voice of thunder, Come [and see]. 2 And I saw: and behold, a white horse, and he that sat upon it having a bow; and a crown was given to him, and he went forth conquering and that he might conquer. 3 And when it opened the second seal, I heard the second living creature saying, Come [and see]. 4 And another, a red horse, went forth; and to him that sat upon it, to him it was given to take peace from the earth, and that they should slay one another; and there was given to him a great sword. 5 And when it opened the third seal, I heard the third living creature saying, Come [and see]. And I saw: and behold, a black horse, and he that sat upon it having a balance in his hand. 6 And I heard as a voice in the midst of the four living creatures saying, A quart of wheat for a day's wages, and three quarts of barley for a day's wages: and do not injure the oil and the wine. 7 And when it opened the fourth seal, I heard [the voice of] the fourth living creature saying, Come [and see]. 8 And I saw: and behold, a pale horse, and he that sat upon it, his name [was] Death, and Hades followed with him; and authority was given to him over the fourth of the earth to slay with sword, and with hunger, and with death, and by the beasts of the earth. 17 And it shall come to pass in the last days, says God, I will pour out of My Spirit upon all flesh. And your sons and your daughters shall prophesy, and your young men shall see visions, and your old men shall dream dreams. 18 And on My servants and on My handmaidens I will pour out in those days of My Spirit; and they shall prophesy. 19 And I will show wonders in heaven above, and signs in the earth beneath; blood, and fire, and vapor of smoke: 20 The sun shall be turned into darkness, and the moon into blood, before that great and notable day of the Lord come: 21 And it shall come to pass, that whosoever shall call on the name of the Lord shall be saved. Joel 2:28 And it shall come to pass afterwards that I will pour out my Spirit upon all flesh; and your sons and your daughters shall prophesy, your old men shall dream dreams, your young men shall see visions. 29 Yea, even upon the bondmen and upon the handmaids in those days will I pour out my Spirit. 30 And I will shew wonders in the heavens and on the earth, blood, and fire, and pillars of smoke. 31 The sun shall be changed to darkness, and the moon to blood, before the great and terrible day of Jehovah come. 32 And it shall be that whosoever shall call upon the name of Jehovah shall be saved: for in mount Zion and in Jerusalem shall be deliverance, as Jehovah hath said, and for the residue whom Jehovah shall call. Genesis 18:32 And he said, Oh, let not the Lord be angry, that I speak yet but this time! Perhaps there may be ten found there. And he said, I will not destroy it for the ten's sake. Luke 2:29-32 Lord, now thou let thy bondman go, according to thy word, in peace; 30 for mine eyes have seen thy salvation, 31 which thou hast prepared before the face of all peoples; 32 a light for revelation of the Gentiles and the glory of thy people Israel. Deut 25:15 A perfect and just weight shalt thou have; a perfect and just ephah shalt thou have; that thy days may be prolonged in the land that Jehovah thy God giveth thee. Deut 28:23 And thy heavens which are over thy head shall be brass, and the earth which is under thee, iron. Re 7:14 And I say unto him, My lord, thou knowest. And he said to me, These are they that come out of the great tribulation, and they washed their robes, and made them white in the blood of the Lamb. Deut 4:29-30 And from thence ye shall seek Jehovah thy God, and thou shalt find him, if thou shalt seek him with thy whole heart and with thy whole soul. Gen. 31:10-12 And it came to pass at the time that the flock conceive, that I lifted up mine eyes, and saw in a dream, and, behold, the he-goats which leaped upon the flock were ringstreaked, speckled, and grizzled. 11 And the angel of God said unto me in the dream, Jacob: and I said, Here am I. 12 And he said, Lift up now thine eyes, and see: all the he-goats which leap upon the flock are ringstreaked, speckled, and grizzled: for I have seen all that Laban doeth unto thee. Ps 89:48 What man lives, and shall not see death? Shall he deliver his soul from the power of Hades? Selah. Rev. 9:1-2 And the fifth angel sounded, and I saw a star from heaven fallen unto the earth: and there was given to him the key of the pit of the abyss. Re 19:7 Let us be glad and rejoice and give glory to him; for the marriage of the Lamb is come, and his bride has made herself ready. 2 Pet 3:8 But do not let this one thing escape you, beloved, that with the Lord one day is like a thousand years and a thousand years like one day. This curse over the whole earth makes the earth livable by restraining evil. The 2 sins restrained by this curse, swearing falsely by the name of God and stealing, both have to do with economic trade. The curse is flying, which means that its retribution is swift. The dimensions 10x20 signify a testimony: history testifies that there is a God ruling over the affairs of men. This much is what brother Witness Lee shared. The dimensions, breadth = 10 and length = 20, also signify the limitations of the curse. The breadth = 10, means that the curse covers the entire earth, because 10 is secular completeness (Gen. 18:32). The length = 20, signifies how long the curse will last. Length often indicates time as in the phrase “length of days”, which is common throughout the Bible. The number for completeness in time for God's purpose is "7" (Dan. 9:23-27). The number 20 is one short of 21, which is 3 x 7. One unit of time before the completion of the age, the curse ends. What are the 20 time units, and when do they start? I believe they are 20 centuries after Christ's death and resurrection. This corresponds to the "2 days", each day being like 1,000 years, during which Israel is apart from God (Hosea 6:1, 2 Pet 3:8). Christ's death and resurrection is the major milestone in the Bible, from which all time is counted. During, or at the end, of the 20th century after Christ's death and resurrection, the curse, which restrains dishonesty, ends. This will gradually produce economic chaos and a more ungodly generation than ever was. Why is the curse only on 2 sins: stealing and swearing falsely? Hasn't God been punishing more sins than these 2? Yes, He has. The point here is not what sins are being cursed, but on what sins will the curse end. If God's restraining power on all sins were to end, that would be too much. Just ending the curse on these 2 sins will cause enough suffering. The New Testament (2 Thessalonians 2:6-8 above) says that some restraining power over sin would be removed before the antichrist is revealed. The next vision in Zechariah tells of the eventual loosing of the restraining power over international trade. The vision in Zechariah 6 tells of the intensification of the black horse (depression) before the great tribulation. The ephah in "all the earth" (v6) signifies international commerce (Deut. 25:15). It is really wickedness, but its appearance in the entire world is as an ephah, something not bad. The lead plate on top of the ephah (v7) is the divine restriction on international trade so that we can have a peaceful existence. The two women lifting up the ephah with the wind in their wings (v9) signifies the extremely fast spread of international trade over the whole earth. This much is what brother Witness Lee shared. The “women” signify that the commerce here is not of necessities, but of things for man's pleasure (Witness Lee's Exodus Life Study on Exodus chapter 1). The building and establishing of a house for the ephah (v10) mean that the restricting lead plate on the ephah is circumvented. The “base” upon which the ephah's house is established is the internet and other technology that have flattened the earth removing much of the time, space and communication constraints in international trade. “In the land of Shinar” signifies a great negative milestone in human history. It is the condition of the world at the time of Genesis 11. Shinar was the name of Babel before God confused the peoples' language. Afterward it was called Babel, meaning confusion. At the time in Genesis 11, if God had not come down and confused man's language, man could have accomplished incredible things apart from God (v6), which would have made it impossible to have 4,500 more years of human history. Now, at the end of the age, mankind has circumvented the restriction with all the computers and networks speaking the same language. There are 3 women with the ephah. 1st there is just 1 woman. Suddenly two other women appear. They are so strong that they lift up the ephah containing the 1st woman along with the lead weight and fly it to the land of Shinar, where workers from all over the globe compete on a level playing field. Women signify nations. I believe that the 1st woman is the western world, and the two new women are China and India, each 1 billion persons strong, suddenly entering the economy. The 1st woman is sitting, taking it easy, while the latter 2 women are flying fast. The first woman no longer has any control in where the ephah is headed, because the ephah is being carried by the two new women, and the 1st woman, sitting in the ephah, is carried along for the ride. The two mountains have to do with the first and second comings of the Lord. From the Old Testament point of view, the Lord's first and second comings are like two mountains in the distance, one behind the other. It looks like the second mountain is right behind the first mountain, but actually it is 2,000 years in the future. The Old Testament does not see the time between the two mountains except for a short time after the Lord's death (until the destruction of the temple in 70 AD) and a short time before the last 7 years before the Lord's 2nd coming (Daniel's 70th week). The two mountains are mountains of brass. They are not physical mountains. Brass signifies judgment (Deut 28:23). The Lord's 1st coming was followed by judgment on Israel in 70 AD when the Temple and Jerusalem were destroyed. The Lord's 2nd coming will be preceded by the great tribulation, which will be a judgment on all the earth (Matt. 24:21;Rev 7:14; Deut 4:30). That the 4 chariots come out from between the two mountains means that these chariots concern the time between 70 AD and Christ's second coming. But since the Old Testament does not see the time from 70 AD until the generation before Christ's 2nd coming, it is only the generation just before the Lord's 2nd coming. The meaning of the 4 chariots of horses is explained in Revelation 6:1-8. The New Testament explains the Old. The Old Testament has details that are not given in the New. 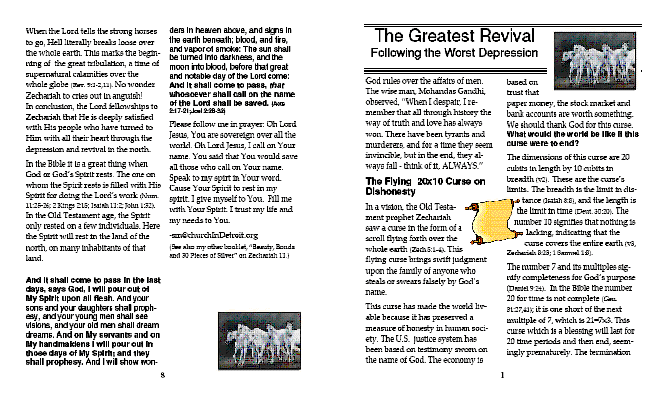 The 4 horses in Revelation 6:1-8 are the history of the world between the Lord's first and second comings. The white horse is the gospel, the red horse is war, the black horse is famine or depression, and the pale horse is explicitly named as Death with Hades (Hell). These 4 are explained by brother Witness Lee in the footnotes of the Recovery Version Bible on that chapter. The colors of the horses in Revelation 6:1-8 match those in Zechariah 6:1-8, and even the chapter and verse numbers match exactly. The only difference in the colors is that the last is “a pale horse” in Revelation, and “hail-colored, strong horses” in Zechariah (v3). The Hebrew word for "hail-colored" is used in only one other place in the Bible as a color (Genesis 31:10,12), where it is translated "grizzled" by American Std Version, but it is the same word translated “hail” many times in the Old Testament. Hail also occurs 3 times in Revelation, and men blaspheme God because of the hail (Rev. 16:21). Hail is colorless, which is pale, and additionally, comes from the heavens signifying judgment from God. While the horses in Revelation are the history of the world for the past 2,000 years, and hence are general, the horses in Zechariah are the culmination of these same horses in the last generation before the Lord's return and are more specific. The horses in Revelation have each become chariots of horses in Zechariah, that is they are many-fold intensified. The order of the horses in Revelation and in Zechariah is the same except that the white horse has moved from 1st in Revelation to 3rd in Zechariah. This is the chronological sequence. From the view of Revelation, the white horse is 1st because the gospel went out right after the Lord's ascension. In Zechariah, in the last generation before the Lord's return, first comes war, then famine (or depression) and then the gospel. The war and depression open people to the gospel. The black horses go north, indicating that the industrial north will undergo depression. Praise the Lord, that the white horses go forth after them into the north. There will be a great revival of the church, mainly in the north. The hail-colored horses go south. We may be seeing the beginning of this with the aids epidemic in Africa. The strong horses seek to go out on their own apart from the hail-colored horses (v.7). Then the angel, who is the Lord (v8), commands the strong horses to go to and fro through the earth. This means that the power of hell is loosed on the earth. This is the beginning of the great tribulation in Revelation 9:1-2. This caused Zechariah to cry out in anguish in v8. Most translate this as "He called me and said to me", but the Hebrew word for called is a very strong word meaning to cry out in anguish, and it is causative, so it should be literally translated "caused me to cry out in anguish". Where did the red horses go? Possibly east. Zechariah is looking east or west. He can see the horses that go north and south because those travel perpendicular to his line of sight. He cannot discern distance in the east/west direction because that is the direction he is looking, just as he cannot discern the distance between the two mountains. The horses can move far in the east or west direction, yet to Zechariah it looks as though they have not moved at all. To the west of Israel is the Mediterranean Sea, so the red horses must have gone in the other direction, that is east. This has begun with the two Iraq Wars and the war in Afghanistan. The 200 million horsemen who kill 1/3 of the earth's population come from the east. This is surely many-fold intensified war. Lastly, the Angel, who is the Lord, says that those who went into the north country have given rest to My Spirit in the north country. To give the Lord's Spirit rest is to satisfy the Spirit, and to give Him a home. The church will have been built up as the Lord's house, for His rest. The bride has made herself ready (Rev. 19:7). This surely is a many-fold intensified gospel preaching and revival! See the following small booklet for more details by clicking the image below. It is formatted to be printed as a booklet on legal (8.5 x 14 inch) paper.